Aluminium Louvre System are designed with a choice of frame options louver blades are available in both 33mm and 50mm pitch and can be glazed directly into the structure or within a window or door arrangement. Aluminium Louvre System has been developed with the intent of providing a pleasing aesthetic appearance at the same time as providing natural ventilation, controlling light and preventing water ingress. Metal Technology’s System 23 Aluminium Louvre System has been developed with the intent of providing a pleasing aesthetic appearance at the same time as providing natural ventilation, controlling light and preventing water ingress. Designed with a choice of frame options, the fabricated louvre panels can be glazed directly into the structure or within other Metal Technology systems. 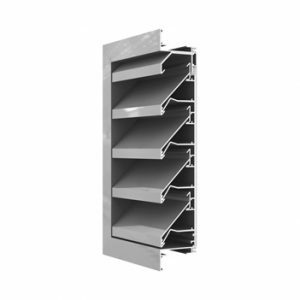 The system offers both 33.3mm and 50mm pitched louvre blades with the additional option of a fly screen or bird mesh depending on the application. The louvre panels can also be provided with an insulated backing to suit mechanical ventilation systems. Metal Technology can design various other profiles which can be incorporated allowing the architects to achieve flexible designs. Metal Technology’s louvre systems are complementary to all their other Metal Technology Systems offering the designer complete versatility.